As a preface to this post, it is critical to declare that the brain is the most complex thing known to man - any model that we use to describe and explain the brain will, at some point, fall short. However, we are in avery exciting period of time where our understanding of the brain is accelerating significantly. Our brain’s resource usage is more or less fixed at about 20% of our body’s food intake, regardless of current activity or state of consciousness. This means that if we use one area of the brain intensively it starves another of resources. This makes intuitive sense; if we are angry then anger subsides as we manage to engage our attention onto something else. This leads to a rather helpful two-mind model. We call the two mind states in this model the blue zone – where we are at our best – and the red zone where we operate well below our full capabilities. In terms of our brain’s resources these two zones or mind states represent having our resources in the most modern parts of the brain, the blue zone, and having them in the more primitive parts, the red zone. The zero-sum model of resource use in the brain, just to reiterate, says that we cannot be highly activated in both blue and red zones at the same time. High red zone activity will mean heavily reduced activity in the blue zone regions. In the blue zone we are optimistic, collaborative and creative, our emotions are largely positive and we can handle complex tasks including higher order learning. In the red zone we tend towards anxiety and pessimism, self-centredness, we tend to generalise about our condition and we can only handle simple tasks effectively. As you will read below, because red and blue zones arise from different brain regions, they are characterised by social orientation, awareness and control, not by mood for instance. The red zone is typified by the classic two-year-old tantrum: it is all about me, I an not all that aware of my mind/brain state and I am unable to make choices to navigate out of this state. Interestingly, this type of behaviour persists for some into adulthood, the only difference being that complexity and masking seems to allow such folk to get away with it more easily. The blue zone, where we are at our best, is all about other people, or 'us', and high metacognitive awareness and choice-making is always present. Hence, you can be in a negative mood per se, yet still manage it, make constructive choices and be focused on others. Here's the thing though: time and time again, research is showing us that we can move away from 'bad moods' and more long term depressive states by focusing our attention on the needs of others. 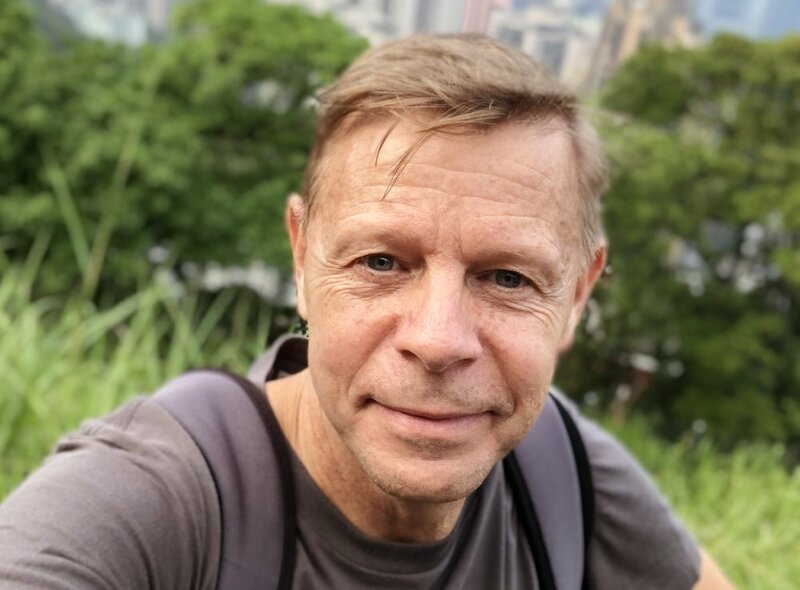 This reverse engineers a blue zone: by focusing on others and managing our 'internals' we are actually using blue zone architecture, forcing resources to the blue zone regions of the brain. Clever eh? The human brain is complex, massively connected and dynamic but for our purposes the following diagram takes a simplified model of the brain, splitting it into three major components: the brain stem and cerebellum (“reptilian brain”), limbic system (“mammalian brain”) and the cortex/neocortex (“human brain”). These are not “brains” in their own right but from an evolutionary standpoint they evolved (and grow in the womb) in this order and the first two are derived from earlier evolutionary forms. The reptilian “brain” has been in evolutionary development for hundreds of millions of years and is very, very efficient at what it does. It controls automatic processes such as body temperature and heart rate and this is where we store habits (in the cerebellum, the cabbage shaped protuberance in the diagram). Anything that we do repetitively will be turned into a habit so that it can be repeated without conscious thought. Much of what we do is made up of habits: getting out of bed, showering, dressing, having breakfast, driving to work. Fight/flight responses are managed from here along with the control of rage – the sudden, impulsive response to an external stimulus. The mammalian “brain” evolved over sixty million years ago to allow adult mammals to have feelings for their offspring and vice-versa. So this is the source of emotions, feelings and moods plus emotional memory. Long-term memory is also here as is our ability to learn from experience. The mammalian brain is pre-verbal so we “feel” this effect, some times called intuition. When we become expert at something and simply “know” what to do then it is this part of the brain at work. It is surprisingly powerful, given its relative size, and many of our decisions are made here. The human “brain” has had less than a hundred thousand years of evolution behind it. It is enormously powerful but rather energy intensive and inefficient. This is the seat of awareness - including our ability to deepen our awareness – and our self-identity. We manage our impulses from here. This is where we can imagine a future different from today, plan to get there and monitor how well our plans are unfolding. This is where we can share our plans with others, through language, and incorporate feedback. We can think and solve problems, we can act as social beings. This part of the brain is not physically, fully developed until adulthood. It is helpful to superimpose the red/blue zones on top of this model. 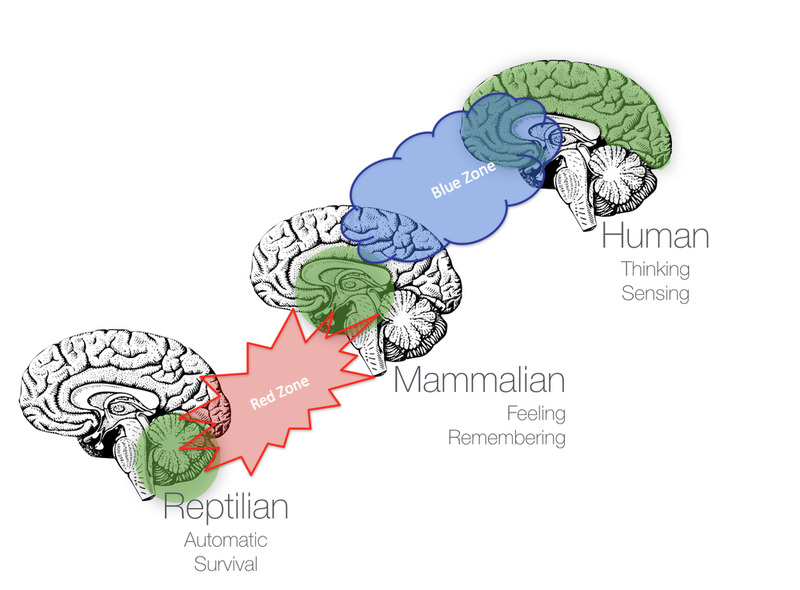 Thus the blue zone involves resources being held in the human and mammalian brains and the red zone involves resources being held in the mammalian and reptilian brains. Thus in both states we have access to feelings and emotions, but coloured by the accompanying brain element. Today most people have experienced both mind states. The easiest way to get into the blue zone is to get a good book and sit in front of a roaring fire (or a setting sun!) with a drink in hand. We have all experienced the red zone mind state. Standing in a supermarket queue and seeing all the other queues move more quickly will usually do it. We tend to think things like “this always happens to me” – a typical red zone, pessimistic and self-centred response. You can be in either mind zone, and be either avoiding pain or seeking reward. While threat avoidance is primarily red-zone biased, reward-seeking behaviour in the red zone cane described by addictive behaviours and patterns. One final, but important point here - our brains are designed to detect difference and this ability is linked directly to the threat reduction architecture. We have probably all had the experience of walking into a room and thinking something has changed, something is different, and then looking around to find out what (e.g. a picture has been removed). This ability switches resources into the primitive part of the brain and means that a red zone that is kept active can be “switched on” by external triggers. From an evolutionary point of view this makes sense – if what we thought was a shadow turns out to be a predator we want to switch fight/flight on very quickly. However, on the reward-seeking side of the equation, this explains why the brain loves novelly, something new. To me, for example, it explains why travel and holidays are so popular, why magic intrigues us, and why we all stand around and stare when there is something unusual like a traffic accident. At the risk of making this an excessively long post, the real value of knowing this is in building blue zone capacity, along with increased ability to manage down your red zone activity. In short, the more you build mindful behaviours (the ability to observe yourself and your surroundings) and metacognitive ability (the ability to think about thinking and feelings), the better the chance you have of living in the blue zone. Ironically, the reverse-engineering tactic of doing something that uses your blue zone, when you are in the red, works very effectively. Simple and symbolic naming of mood, for example, requires blue zone regions to come into play. Naming your mood, or even acknowledging that you are in a red zone moment, will help towards restoring the blue zone. More on this in another post, and I've included a downloadable resource below on Staying Calm Under Pressure. Acknowledgements: Part of the content above was adapted from John Corrigan's article: Education 3.0: the effect on the brain - see http://www.gr8education.com for more information about John, one of the authors of The Success Zone. Aug 15 How do our brains compare to the internet?